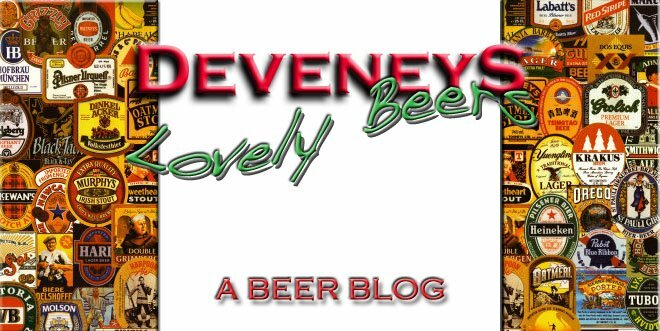 Deveneys of Dundrum: Aecht Smoked beer and Hacker Pschorr Gold. 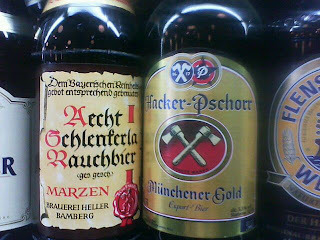 Aecht Smoked beer and Hacker Pschorr Gold. These 2 new editions to the Deveney's beer family arrived last night. My first ever smoked beer - Aecht Schlenferla Rauchbier, Marzen. I'm pretty sure that we're not going to be great friends but I'll definitely give it a go for curiosity purposes alone. This is a dark, aromatic, bottom fermented beer. The malt is exposed to the smoke of burning beech wood during the malting process and is then mixed with premium class hops and matured in 700yr old cellars in the hills of Bamburg. The brewery's description of the beer is ''Even if the brew tastes somewhat strange at first, swallow, do not stop because soon you will realize that your thirst will not decrease and your pleasure will visibly increase''...... I'll be the judge of that!!! The 2nd new arrival is, i think a little easier on the palate. Hacker Pschorr Munchener Gold. These guys are renowned for their wheat beers and as their brewing process has virtually remained unchanged for over 580years this reputation is not surprising. The history of the brewery can be traced back as far as 1417. Expectations are pretty high for this!!! Gotta take my work home with me this evening..... Seriously tough job!!! Spelling Nazi says: that's a K -- Schlenkerla. Stupid Germans. Schlenkerla Maerzen is an all-time favourite of mine. Great to hear you're stocking it.